Researching my ancestor Giles Cromwell who left England and settled in Newbury, MA has been both extremely frustrating and a great learning experience. Frustrating because of all the erroneous errors attached to him that, in this great age of the internet, have multiplied and spread by copy and paste family researchers. I have dubbed this stuff "junky genealogy". At the same time I have learned a great deal about genealogical research and English history while trying to find the "real Giles Cromwell". I think the best place to start is with who Giles Cromwell was not rather than who he actually was. The vast majority of internet based genealogies, including ancestry.com claim that Giles was the son of Sir Oliver Cromwell. This is not true and it would be funny except for the fact that so many people have copied this into their family trees confusing anyone who is looking for factual information. Sir Henry Cromwell Giles Cromwell, son of Sir Oliver Cromwell, grandson of Sir Henry, was born into turbulent times. His father, born 1562, was the son of Sir Henry Cromwell, "the golden Knight", known for his lavish spending and lifestyle. The family name was originally Williams but they took on the name Cromwell in honor of their illustrious and ill fated ancestor Thomas Cromwell of Henry VIII fame. 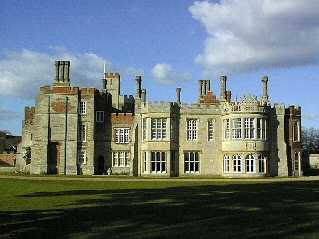 Sir Henry was knighted by Queen Elizabeth after she spent two nights at Hitchenbrook, the family home, in 1564. He served as a member of Parliament and served four times as the Sheriff of Huntingdon. Sir Oliver's mother was Joan, daughter of Sir Ralph Warren, twice mayor of London. Sir Henry died in January of 1604 and was buried at All Saint's Church in Huntingdon. He had already turned over Hinchenbrook to his son and heir, Sir Oliver in 1602. Sir Oliver Cromwell As the eldest son, Sir Oliver inherited the bulk of Sir Henry's estate. The family divided their time between the two great houses of Hitchenbrooke and Ramsey Abbey. Sir Oliver was first knighted Queen Elizabeth I. He was also knighted by King James of Scotland after his stay at Hitchenbrooke as he made his progress from Scotland to England to claim the English throne, following the death of Queen Elizabeth in 1603. Sir Oliver played an active role in Parliament, representing the county of Huntingdon at various times between 1604 and 1625. He was one time the Sheriff of Huntingdon and Cambridgeshire. Like his father, Sir Oliver lived lavishly. 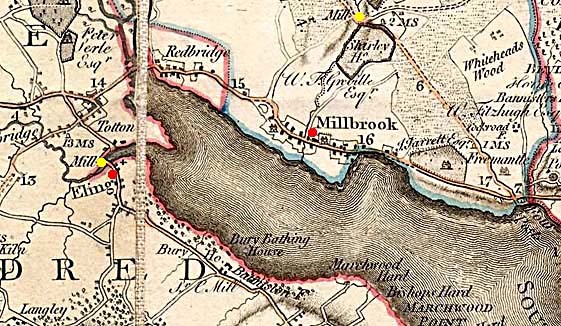 He was forced to sell Hinchenbrooke house in 1626. Sir Oliver died in 1655. Elizabeth Bromley Sir Oliver married twice. His first wife was Elizabeth daughter of Sir Thomas Bromley, former Lord Chancellor of England. They married sometime before 1586, she died on 27 July 1600. Anna Hooftman Sir Oliver married Anna Hooftman on 7 July 1601. She was the daughter of Gielis van Eychelberg alias Hooftman of Antwerp. Anna was the widow of Sir Horace Pallavacini a Genoese nobleman employed by Queen Elizabeth to raise funds, he died in 1600. Sir Oliver's financial situation was vastly improved with this marriage as Anne was quite a wealthy widow. To keep the money in the family he and Anne arranged for three of his children to marry three of hers. Anna died on 23 April 1626. In her will she left her son Giles various properties in the Low Countries. Giles d. 1634 never married, buried in The Great Church in the Hague. On the side of the King in the English Civil War During the English Civil War of 1642-1651, Sir Oliver Cromwell and his sons were unswerving on the side of King Charles I. Although described as a man of Puritan callings, Sir Oliver was an ardent loyalist, he supported the Crown til the last, even to the point of raising troops at his own expense. Henry Cromwell His son and heir Henry had his estates sequestered by Parliament. 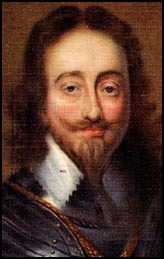 Henry fought with the Royalist army at the battle of Winceby in 1643. Henry's son James was a Colonel in the Royalist army, and his son Henry so hated the name Cromwell that he reverted to using the surname of Williams. Sir Oliver's son John was a Captain in the First Regiment of Foot sent by King James I to assist in recovering the Palatine for his daughter Elizabeth and his son-in-law Frederick the Elector of Palatine, the once King and Queen of Bohemia. John became a Colonel in Holland and was chosen by the Prince of Wales, the future King Charles II, to deliver a letter from Charles to his cousin Oliver Cromwell asking him to spare the life of his father, King Charles I. Obviously Oliver Cromwell was not swayed by the missive from Charles. William, third son of Sir Oliver was also in the service of Frederick, Elector of Palatine. He held the rank of Colonel and served in the wars for the Crown of Bohemia. He died of the plague in 1655 and is buried at Ramsey Abbey. Giles Cromwell son of Sir Oliver and Anna Hooftman was a Gentleman in Waiting to the King of Bohemia. In a 17th century genealogy of the Hooftman van Eijehelberg family the writer remarks on the death of Anna Hooftman in May of 1626, he goes on to comment that he made the acquaintance of his cousin Giles Crommuel, a young man of about 21 years, who was a page at the court of the Queen of Bohemia, and resided at The Hague. Giles is mentioned in a book "The Letters of Elizabeth Stuart: Queen of Bohemia" by Nadine Akkerman. She writes "he delivered a letter to Elizabeth from her husband Frederick. In 1 March 1632 Sir. Cornelius Hooftman wrote his will. He made a bequest to the children of Anna Hooftman now wife of Oliver Cromwell. He left them "different lands in the environs of Andver and money amounting to 12,400 carolus florins. Giles wrote his own will two years later on 2 May 1634. Giles was a loyal Palatine servant who left many bequests to the Gentlemen and Gentlewomen of the Queen of Bohemia. In his will, of which I have a copy, he named his sister Anne Balwine, the children of his deceased sister Mary Rolte, his brother Henry, John and William. He left his land and money that he had so recently recieved from his Uncle Cornelius Hooftman to the children of his sister Mary. There is no doubt that this is the will of Giles Cromwell, son of Sir Oliver Cromwell. The will is kept in the Hertfordshire Archives and Local Studies. You can get a copy from the British website Access to Archives. He died and was buried in the Great Church of The Hague in May of 1634. Bequeaths. money and jewels to: sisters Anne (wife of John Baldwin) and Mary (wife of Edward Rolte); Uncle Sir Cornelis Hooftman; Cousin Lord Gerard Van Randenrode; Uncle/Cousin Van Nispen; Godson Giles Rolt (nephew); brothers Palavicino; William Cromwell and John Cromwell; William Grudge and Edward Pue, servants; Peter Fannius, secretary of Bewershaven; ladies and Gentlewomen of Queen of Bohemia an Gentlemen (his comrades); cousins Van Sevender and Margaret Van Vosbergen. I don't think you can argue this one. Giles Cromwell, son of Sir Oliver, served the Queen of Bohemia at The Hague in the Netherlands. He died and was buried there, he did not come to America. So, who is Giles Cromwell of Newbury? Giles Cromwell of Eling, England and Newbury, Massachusetts Okay, I know you're disappointed, but wouldn't you rather have the truth than some made up genealogy. So, what do we know about Giles Cromwell of Newbury. If he was the Giles married to Alice Weeks in 1630 he was probably born about 1600-1605. Eling is quite close to the port city of Southampton so we can guess that Giles and Alice embarked on their new life from there. Arrival It is not known when Giles arrived in the Massachusetts Bay Colony, but we know he was in Newbury by 1645, when he contested the will of one Thomas Cromwell. His relationship with Thomas is unknown, possibly an Uncle or a cousin. Both of Giles' wives were named Alice. It is very possible that he was the Giles Cromwell, Miller, who married Alice Weeks in Eling, Southampton, England. Alice died sometime prior to 1648 when Giles married a second time to Alice Wiseman. He wrote his will in 1672 and died, after a lifetime of hard work, on 24 Feb 1673. He was unable to sign his name so he made his mark on the will. 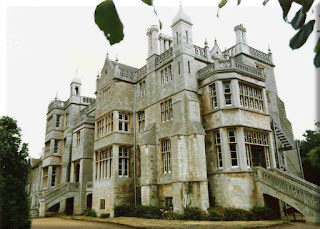 He left his very modest estate to his surviving children, Phillip and Argentine. That, my friends, is about all we know about Giles Cromwell of Newbury. Note Jane Cromwell Pickering is also not a relation to Sir Oliver, nor is she related to our Giles, see my article on Jane Cromwell. Conclusion I hope that you agree that other than their name and the fact that they were contemporaries living in the same time period, these two men had very little in common. One the son of a wealthy, educated man, raised surrounded by Royalty and other persons of importance. the entire family was zealous in it's loyalty and service to the crown of England. The other Giles is a miller by trade from another part of the country, who leaves England to become a farmer of modest means in New England. How anyone could suppose that these men are one and the same is beyond me. I am quite happy to claim Giles Cromwell, miller and farmer, of Newbury as my ancestor. P.W. Hasler, The History of Parliament: The House of Commons 1558-1603, digital images, The History of Parliament (www.http://www.historyofparliamentonline.org/research/members/members-1558-1603 : accessed 27 December 2015), member profile for Cromwell, Oliver (?1566-1655), of Godmanchester and Hinchingbrooke, Hunts.). W. D. Sweeting, Fenland Notes and Queries, A Quarterly Antiquarian Journal for the Fenland, In the Counties of Huntingdon, Cambridge Lincoln, Northampton, Norfolk and Suffolk, Vol. 5 (Jan 1901-Oct 1903), 214, digital images, Archive (https://archive.org :accessed 27 December 2015). Kathy Lynn Emerson, A Who's Who of TudorWomen, http://www.kateemersonhistoricals.com/TudorWomenHi-Hu.htm, accessed 27 December 2015, entry for Anna Hooftman. James Waylan, The House of Cromwell and the Story of Dunkirk, (London: Chapman Hall, 1880), 75, digital images, Google Books (https://books.google.com : accessed 27 December 2015). Mark Noble, Memoirs of the Protectorate: House of Cromwell, (London : Pearson & Rollason, 1784), digital image, Google Play (https://books.google.com : accessed 27 December 2015),58. [Hampshire Marriage Licences 1607-1640 by Church of England Diocese of Winchester by Arthur James Willis (1960), p. 68]. John J. Currier, History of Newbury, Mass., 1635-1902, (Boston: Damrell & Upham, 1902),digital images, Archive (http://www.archive.org). Can I copy and paste some of this to my Cromwell in Ancestry.com? It was a huge help and insurance against other's errors from my tree, thank you so much!